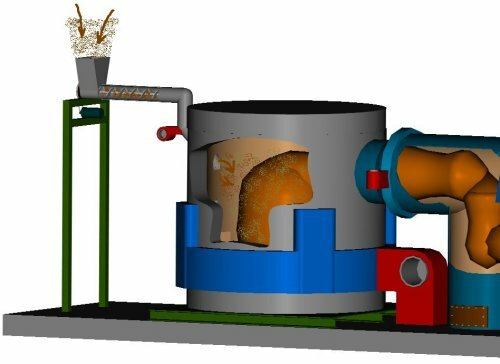 The Moss pneumatic wood combustion system can be used on many different boiler designs from HRT, watertube, hybrid or scotch marine firetube designs. It is a very flexible design and can release heat quickly to the boiler so that steam pressure drops can be prevented. The system is very safe to operate and is controlled by our custom designed PLC control system software (described herein under Combustion Controls). The Moss pneumatic combustion system can burn dry or wet fuel. If the system is burning wet fuel, we suggest that a combustion air preheater of some type be provided in order to drive off moisture quickly once the fuel is injected into the combustion chamber. Preheating the underfire air to approximately 300° F. or more is recommended. This preheated combustion air process keeps firebox temperatures hot and steam pressures at their setpoint. Air can also be preheated by installating an steam heat exchanger in the combustion air ductwork. The forced draft fan provides the required air to the combustor for the combustion process. This system is very flexible when burning fuels with various moisture contents and weights. These variances could be due to the changing of the species of wood being processed in the customers plant or if the fuel is purchased from outside sources. In either case, the fuel supplied to the combustion system varies and these variations can cause major problems with some combustion systems. The Moss pneumatic combustion system is the best system to overcome these operating parameters. Our pneumatic combustion system incorporates years of experience in the wood burning industry into one safe and highly efficient system. When controlled by our PLC control system, we believe there is no better system in the market. The best thing about the system is that it is very economical to purchase! We encourage you to provide us with your steam requirements and fuel availability so that we can design a system that is efficient, safe to operate and requires low maintenance.